John Moore has been ordered to stay away from Glasnevin cemetery. THE TRIAL OF a Dublin man accused of vandalising Eamon de Valera’s headstone is too serious to be heard at district court level, the DPP has decided. John Moore, 57, of Cherrymount Crescent, Clontarf, was charged earlier with causing criminal damage to Eamon de Valera’s headstone and unlawful possession of a hammer in connection with the alleged incident on 25 January at Glasnevin cemetery in Dublin. He faced his third hearing at Dublin District Court today when the case was listed for directions from the DPP to be given. Judge Anthony Halpin granted the State’s application to drop the charge relating to the hammer. He also heard that the DPP has directed trial on indictment in relation to the criminal damage charge meaning it is to be heard in the circuit court which has tougher sentencing powers. Moore asked, “Why is it so severe?”, adding that he was offering to plead guilty and he was willing to compensate for the damage. As a condition of bail he is banned from the graveyard and he said this “has been torture” as he has a child buried there. Judge Halpin noted he has offered to plead guilty and explained to him that the DPP is an independent prosecution officer. He told Moore she has decided that “this is a pretty serious offence that is why it is going to a judge and jury”. He said the case was being adjourned for six weeks to allow time for the book of evidence to be completed. Moore, who had not sought professional legal assistance, agreed to the judge’s offer to grant legal aid. Solicitor Peter Connolly was assigned to represent him. Moore was remanded on continuing bail. His bail terms state he must stay away from all members of the de Valera family, stay away from Glasnevin Cemetery, have no contact with the de Valera family or any of their properties or assets, sign on every Monday, Wednesday and Friday at Clontarf Garda station and reside at his current address. Former Taoiseach and Easter 1916 Rising commander Eamon de Valera died in 1975 and was buried in Glasnevin Cemetery. 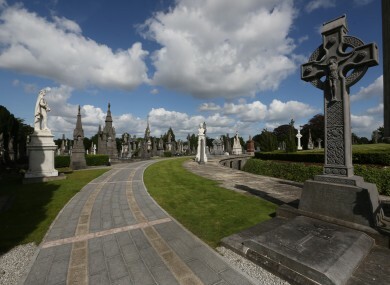 The graveyard is the final resting place of several key figures in Irish history including Michael Collins, O’Donovan Rossa, Daniel O’Connell and Countess Markievicz and Charles Stewart Parnell. At his first hearing, on Jan. 26 last, the court heard Mr Moore’s reply to the criminal damage charge was “I’m guilty”. Comments are turned off as legal proceedings are ongoing. Email “Man accused of vandalising de Valera's grave ordered to stay away from Glasnevin Cemetery”. Feedback on “Man accused of vandalising de Valera's grave ordered to stay away from Glasnevin Cemetery”.